Whoa. Every so often, a giant in Round Rock pokes it head up above water long enough to put forth a truly mesmerizing design, and while it’s no Adamo, this is most definitely the freshest take we’ve seen on tablets in a very, very long time. The gallery below showcases a prototype that’s lounging around within Dell’s top secret labs, a 7-inch slate that’s adorned with a slide-out keyboard. Said keyboard, however, is hardly typical — it’s rocking a split-key design that’s not at all dissimilar to the virtual layouts recently showcased within iOS 5 and Windows 8. So far as we can tell, the entire alphabet’s present and accounted for, and there’s a rear camera that’ll be more than happy to make your child’s next birthday party a bit more awkward. Outside of that, we’ve no other details to pore over, but it’s safe to say that we’ll be doing our darnedest to change that. Oh, and if you’re doubting that this thing has a future as a real-deal product, there’s a shot just south of these very words showcasing what looks to be a commercial / press render. Delicious. 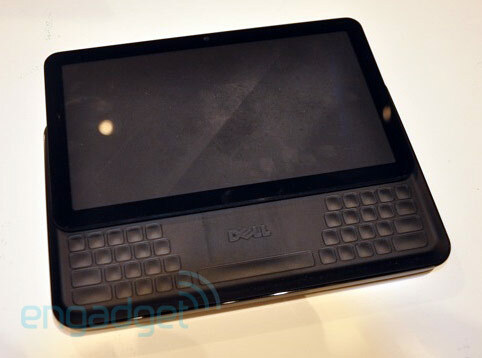 Exclusive: Dell’s prototype 7-inch tablet touts slide-out split QWERTY keyboard originally appeared on Engadget on Wed, 08 Jun 2011 20:30:00 EST.